TORONTO, Oct. 12, 2017 /CNW/ - LG Electronics (LG) is introducing the LG V30, the latest iteration of the company's V series flagship smartphones, to Canadians on October 20, 2017. The LG V30 marks an ultimate expression of visual quality, with seamless curves, minimal bezels, and a 6-inch OLED FullVision display spanning from edge to edge - all fitting in the palm of your hand. The LG V30 created strong interest at this year's IFA 2017 in Berlin, winning 26 awards, the most for LG at the annual trade show. Audiences praised the LG V30 for its superb design and range of innovative features with experts predicting it will be the phone to beat when it comes to creating professional-quality content without professional-level complexity. To best deliver consumers' preference for big screens in small bodies, LG engineers squeezed a 6-inch, 18:9 OLED FullVision display into a frame that is 8mm shorter and 3mm narrower than its predecessor. Sheathed front and back in tempered glass that curls around its edges, the V30 won accolades for its exquisite look and feel. Weighing in at only 158g, the V30 is the lightest smartphone in the 6-inch and over smartphone category. Both the LG G6 and LG Q6, launched this year, also feature 18:9 FullVision displays. "The V30 was designed to help consumers best capture the experiences that make up our life stories," said Juno Cho, president of LG Electronics Mobile Communications Company. "Its functions and features delight our senses of sight, sound and touch and when it comes to looks, it may just be the most beautiful smartphone we've ever developed." LG is a leader in smartphone photography, and the V30 extends this legacy. 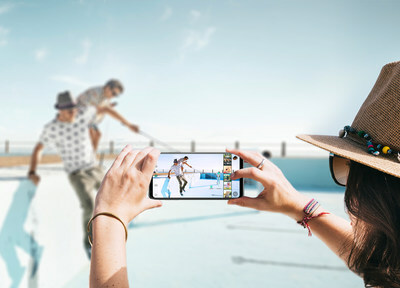 The phone features many industry innovations, including the first F1.6 aperture and glass lens in a smartphone camera, the ability to produce near professional quality movies and videos by shooting in LG-Cine Log format and the smartphone industry's first OLED display in FullVision format. "The LG V30 was developed with the everyday and professional content creators in mind," said Shelly Walia, Brand Manager, Mobile Communications at LG Electronics Canada. "The device features easy-to-use mobile multimedia features which can be tailored by the user to realize pro-quality results." The F1.6 aperture lens that highlights the main camera captures more light for brighter-than-ever shots. The Crystal Clear Lens is composed of glass, a material usually only found in higher-end cameras that delivers more accurate colours and crisper images than traditional plastic lenses. As a video capture tool, the V30 is equipped with Cine Video mode to make anyone shoot like a pro. Cine Effect features 15 different presets that emulate genres from romantic comedy to summer blockbuster. And industry-first Point Zoom allows one to zoom in on any subject in the frame, not only the centre object. LG-Cine Log saves files while preserving a wide dynamic range and colour gamut to allow for more adjustments in post-production. All this, when combined with the QHD+ (2880 x 1440) OLED FullVision display, offers faster response times and minimizes afterimages for the ideal Google Daydream VR experience. 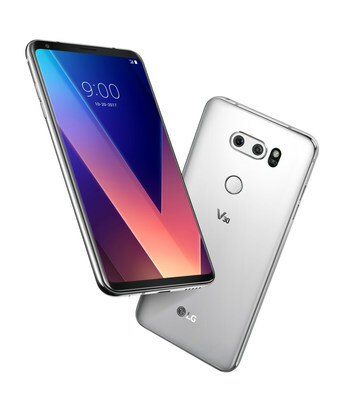 The LG V30 will be available at the following carriers: Rogers (online and select stores), Fido, TELUS, Bell, Freedom Mobile, SaskTel and Koodo Mobile (online and select stores); and the following retailers: Best Buy Mobile, WIRELESSWAVE and TBooth Wireless. Check with your other local retailers for availability dates. The LG Electronics Mobile Communications Company is a global leader and trend setter in the mobile and wearable industry with breakthrough technologies and innovative designs by continually developing highly competitive core technologies in the areas of display, camera optics, audio and battery. LG creates handsets and wearables that fit the lifestyles of a wide range of consumers all over the world. LG is seeking to provide a mobile experience that extends beyond the scope of traditional smartphones. For more information, visit www.LG.com.